One of Abbey's famous outdoor blackboards. 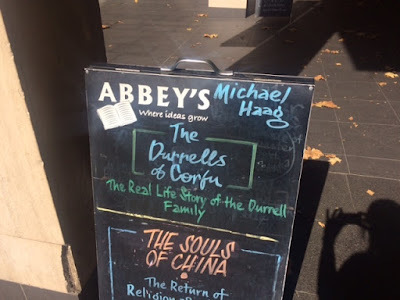 Abbey's is a leading independent bookshop in Sydney, Australia. Their promotions are simple but effective. They have two blackboards that they place outside announcing recommended titles inside. Publishers covet a position on the blackboards - only two titles are mentioned on each, four in all - and the books then sell like hotcakes.